Search engine optimization is a vital marketing tactic and sales driver for any short-term rental property manager. The best way to build your business's brand is creating interactions between your personal channel and guests. While listing sites are a critical part of any marketing and sales strategy, direct bookings put your name and brand at the forefront of a guest's experience, increasing your chances of repeat bookings. How do you create more direct bookings? By investing in SEO. In fact, SEO traffic drives more direct bookings than any other form of traffic volume in the short-term rental industry. The final stat is great news! This means that most guests aren’t loyal to any hotel or even previous vacation rental brands or businesses: you can convince them to book with you. Can I actually get bookings from Google? Booking intent. Potential guests who come to your website after searching for ‘vacation rentals in area’ are looking for exactly what you’re offering on your website. As a result, a good portion of those visitors tend to inquire or book. Long-term staying power. While seeing results from SEO isn’t immediate, you can continue earning traffic to your site for a long time with content you wrote years ago. This means that you can see traffic to your website grow over time as you continue your SEO efforts. This is good news for you: it means that the traffic you organically earn from Google is likely to turn into real paying guests. Traffic estimates June 2018 via Ahrefs. To put these numbers in context, here’s the percentage breakdown of organic traffic sources for these sites. They rely on search for a significant part of their overall website traffic. For example, over 50% of Flipkey’s overall traffic is just from search! 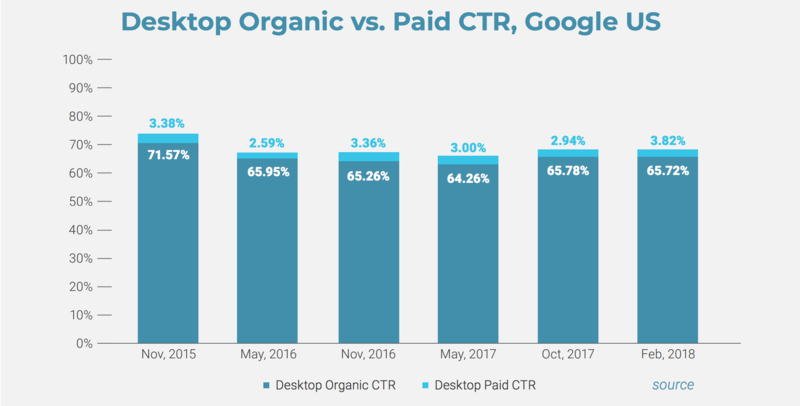 In other words, if you get leads and bookings from these listing sites (or ever have in the past), they’re getting a solid portion of their own website traffic through Google search. So, why not “jump” the middleman and get a portion of this traffic for your own business? We’re not trying to say that you can compete with the listing sites nationally. Rather, your organic search goals should be to compete with the listing sites only in your destination(s). Studies show that while the popular listing sites usually rank on the first page of Google, many local websites often rank ahead of these listing sites. I’ve heard SEO is dead...is that true? SEO is alive and well! 65% of the billions of search queries made on Google end with clicks on the organic search results. This means that if a Google keyword has 1,000 searches per month, 650 people click on the organic search results and visit a website; those websites do not have to pay for that click, like they would for clicks from Google Ads. Hopefully this was enough to demonstrate that SEO is worth investing in. So what are the next steps? Download the MyVR SEO eBook to find out!